Hallo aviators. Busy flying? In positive, you might be aware of the importance of a good aviation headset. A good pair of aviation headphones is a must for flying a plane no matter why you fly. But with all the headphones on the market, it is not easy to find a headphone that will give you the best value for your money. You have to look for excellent quality with greater comfortability and lots of essential features at a reasonable price. But you don’t have to worry as today we bring you the Bose a20 review. Keep reading to know why this is one of the most highly acclaimed noise reducing aviation headphones in the market and details about it. You may find out this as the right choice for your need. There are many types of aviation headsets on the market, they include various features. But if you want to buy a good quality headphone then there are some particular features that you should look for. Before we move on with our bose a20 aviation headset with bluetooth review, here are some of those features that you should focus on. Comfort is a key feature what you should look for while buying an aviation headphone. Sometimes you may have to use your headphone for a long time. If your headphones are not comfortable and light enough then it can be very painful for your ear. The clamping force also should be minimal. Noise reduction is one of the main reasons why you should buy an aviation headphone. So a good quality headphone should have greater noise reduction capabilities. It should also provide clear audio so you don’t have to struggle to listen while communicating. We live in an era when most of our devices are becoming wireless. Therefore today a good quality headphone should have wireless capabilities so you don’t have to hassle with cable and focus on flying. You should also consider certification while buying a headphone. A good quality headphone should be certified by FAA or EASA. Noise reduction is 30% greater than conventional headsets. Clamping force is 30% less than normal headsets. Customizable audio prioritization control with “mute” and “mix” settings. Bose Active EQ automatically equalize incoming signals. Bluetooth can be used for receiving phone calls or to stream music. it can be connected to more than one wireless device simultaneously. Intuitive headset operation, just plug it in and turn it on. Bose a20 headset is designed with user’s comfort in mind. It is made in such a way that it will provide you greater comfort than conventional headphones from short stops to long haul. 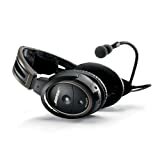 It is one of the lightest headsets in the market at just 12 ounces. As it comes with 30% less clamping force and sheepskin cushions so it will definitely improve your flight experience. With its breakthrough innovation in reducing noise the bose a20 provides industry-leading noise reduction which is 30% greater than conventional headset. Proprietary technologies in Bose a20 reduce noise even in a louder environment and provide clear audio simultaneously using Bose Active EQ. Certified to FAA TSO-C139. It even meets RTCA/DO-160D environmental requirements. Bose a20 is the most technologically advanced around-ear headset from Bose. It is filled with incredible features like 30% greater active noise reduction, 30% less clamping force, customizable audio prioritization, active equalization, Bluetooth connectivity, high-performance mic, intuitive operation, long-lasting battery life and more. It is fully certified by FAA and even meets environmental requirements. And its weight is just 12 ounces. It is very hard to find an aviation headset that offers such an exceptional combination of features and benefits in the market other than Bose a20. 20 years ago active noise reducing headsets were first introduced to aviation by Bose. Now again with its breakthrough innovation, Bose presents Bose a20 aviation headset. The bose a20 offers 30% greater noise reduction than conventional headsets. It has microphones both inside and outside each earcup to sense and decrease ambient sound. You will get a more quiet and peaceful flight with Bose a20. It provides greater comfort than any other headset on the market. With its choice of materials and distribution of weight, it ensures your comfortability in all types of flights, short or long. You can also wear eyeglasses comfortably with it. It’s simple, intuitive operation allows you plug-and-fly convenience. Just plug it in, turn it on and go airborne. Also offers both auto-on and auto-off capabilities. Question: What comes with the headset? Answer: In the box, you will get 2AA batteries, Aux-in cable adapter, Carrying case, In-line clothing clip, and a Control module. Question:Is it possible to change the plug type later? Answer: Bose A20 is a modular system, so you can replace the entire cable assembly with a different type or you can use adapters to convert it as you like. Question:Does it comply with FAA requirements? Answer: Yes, it meets or exceeds all FAA requirements and also approved by all US Airlines. Question: How can I understand if the batteries are low? Question:Does it work even if the batteries are dead? Answer: Yes, you can transmit and receive normally with ATC even after the batteries are dead. It will work as a passive noise attenuation headset then. But the active noise cancellation and Bluetooth won’t work. Question:Does it have automatically on/off feature? Answer: Yes, if you turn on the avionics the headset will automatically turn on when the aircraft power is detected. As you can see in our bose a20 aviation headset review should have features like greater noise reduction, clear audio and comfort, which the Bose a20 have. However, you can’t disconnect the mic from the headset and use it for listening only. If you want this feature you should buy the Bose Quiet Comfort 3 Acoustic Noise Cancelling Headphones. It provides high-performing noise reduction and you can use it for home, work and travel comfortably. It is also cheaper but you should decide carefully as it does not have all the features of bose a20. 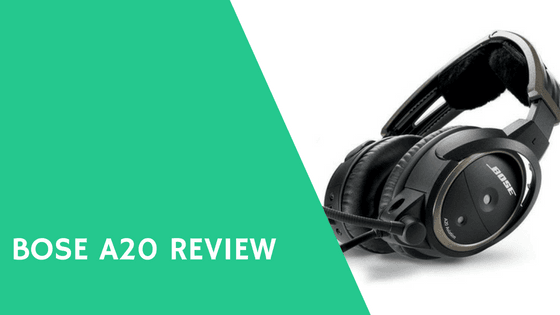 If you want an aviation headset for higher noise environment such as non-pressurized aircraft then bose a20 headset, which has around-ear configuration is perfect for the job as shown in this bose a20 review. But if you work in a moderately less noisy environment, such as pressurized jets then you should go for Bose Pro Flight Aviation Headset which is the smallest, lightest and more comfortable headset from Bose. It features in-ear configuration with three level of noise cancellation. Although it shares many features with a20 headsets you have to remember the ProFlight delivers significantly lower noise reduction compared to the a20 headset. With its unmatched combination of comfort, noise reduction and clear audio the Bose a20 definitely is the industry-leading aviation headset. Considering all the advanced features it has that pilots value like Bluetooth music streaming and customizable audio prioritization, it can be clearly stated that it is one of the best over-ear aviation headsets in the market. With its simple, intuitive operation featuring auto-on and auto-off capability, it helps you to stay focus on what really matters-flying. Designed for higher noise environment, it fulfills all the needs that one can have as you can see from our bose aviation headset review above. If you want to buy this then you can simply ignore its minor flaws as it won’t really create any problem while flying. We think everything you need to know about this device has been described in our review. With all its features it will surely give you the best value for your money.